Microfracture : Microfracture involves creating numerous tiny holes in injured joint surface using a special tool, called ‘awl'. The holes are made in the bone under the cartilage, called as subchondral bone. This creates a new blood supply to the cartilage which stimulates the growth of new cartilage. Drilling : This procedure is like microfracture where multiple holes are created in the injured joint area using a surgical drill or wires. 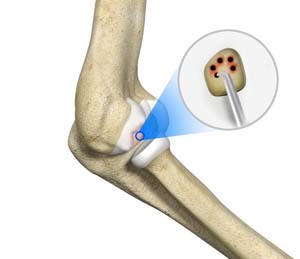 Abrasion Arthroplasty : This procedure is like drilling but involves use of high speed burs to remove the damaged cartilage. Autologous chondrocyte implantation (ACI) - Ii is a two-step procedure, where healthy cartilage cells are removed from the non-weight bearing joint, grown in the laboratory and then implanted in the cartilage defect during the second procedure. During this procedure, a patch is harvested from the periosteum, a layer of thick tissue that covers the bone and is sewn over the defected area using fibrin glue. The new cartilage cells are then injected under the periosteum into the cartilage defect to allow the growth of new cartilage cells. Osteochondral Autograft Transplantation : In this procedure, plugs of cartilage is taken from the non-weight bearing areas of knee, from the same individual and transferred to the damaged areas of the joint. This method is used to treat smaller cartilage defects since the graft which is taken from the same individual will be limited. Osteochondral Allograft Transplantation : In this procedure, healthy cartilage tissue or a graft is taken from a donor from the bone bank and transplanted to the area of cartilage defect.